We see in the paranormal every day paranormal ignorance. The wanting the unknown to be paranormal without looking for the truth. How many even look at exif? How many take control shots? 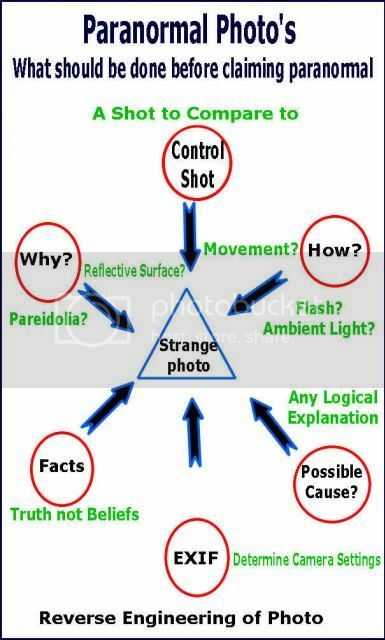 Its amazing these people who claim to be scientific do not know what exif is or camera settings. They do not understand flash versus ambient light. They fail to reverse engineer a picture as it may show them the truth. Mists and breath can show up in a picture when its not visible to the human eye and its explainable not paranormal. We see teams that capture a reflection of a shiny surface show another team for verification its paranormal. So we now have ignorance times two. We see so many claim they want to help their client but will tell them dust is a demon. So until you start actually looking for the truth do not tell me your an investigator or researcher. Thanks for the info, I was always weary on understanding shutter settings. I just joined this forum, and this is the first post I've read here. I see that it has been here awhile, but I also know that this post is the absolute best reason I could've joined this forum. It is incredibly well put together and filled with applicable, important information. Very well done...thank you for sharing! See Ugly and Rude, you are loved. Always in the beginning anyways. So you just keep on being that saucy, sassy, skeptic. Great info! Thanx for taking the time to share it. Lol sorry things are funny.However thanks for shareing.No wonder I'm photo shy,& try 2 avoid anything high tech. Very good information & correct!!! And your reason for posting a a modified picture is?